TIJUANA, B.C. 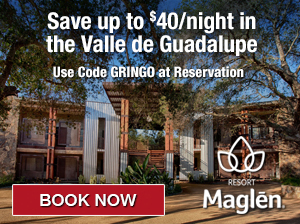 – From the 1940’s through the 60’s, Tijuana’s population bulged with an influx of Mexican nationals seeking jobs in the booming agricultural industry then developing across the southwestern US. The city’s numbers grew again every weekend as US servicemen from new Southern California military bases came to TJ in search of drink, good times and girls. During this “second phase” of Tijuana’s development, cooks and restaurateurs from all over Mexico capitalized on the city’s growth and opened street carts from which they sold – and still sell – tacos, carnitas, mariscos, tortas and other specialties from their hometowns. Today, food truck and stall-based food courts, commonly known as colectivos, are becoming popular with hungry locals as well as visitors from Southern California. This recent trend started with Zona Rio’s Food Garden, a colectivo that opened in 2013. For Tijuana chefs and restaurateurs, colectivos are an affordable way to open shop with minimal capital outlay. Graduates of the Tijuana School of Culinary Arts and other institutions own and operate many of the trucks and stalls around town. We recently visited four of Tijuana’s hottest colectivos and have heard very good reviews coming in on a fifth. A visit to any of these spots will be rewarded with good food, ambiance and value. And to be clear, TJ colectivos aren’t just for hipsters anymore – the culinary choices here appeal to a wide variety of ages, tastes and budgets. Tacos from La Carreta, Estación 55, Tijuana. Estación 55, Tijuana’s first food truck court, opened in March 2014. The founding restaurant wasn’t actually a truck at all. XL Burgers is a school bus that’s been converted to a kitchen and dining room. Other trucks and stalls soon followed, including Urban Cocina, Parilla Tapatia and Koi Japanese. MUST TRY: Carreta’s shrimp al pastor taco. Succulent Baja shrimp marinated and grilled al pastor intermingles with pineapple, pickled red onion and cilantro atop a light layer of queso. Delicious and all the ingredients work very well together. Estación 55 is located at Avenida Abelardo L. Rodríguez 2801 near the intersection of Agua Caliente and Cuauhtémoc Sur Poniente Blvds. 22044 Tijuana. +52 664-123-8230. facebook.com/foodtruckstijuana. Open Tue-Thu 1PM-8PM, Fri & Sat 1PM-12AM, Sunday 1PM-8PM, Closed Mondays. 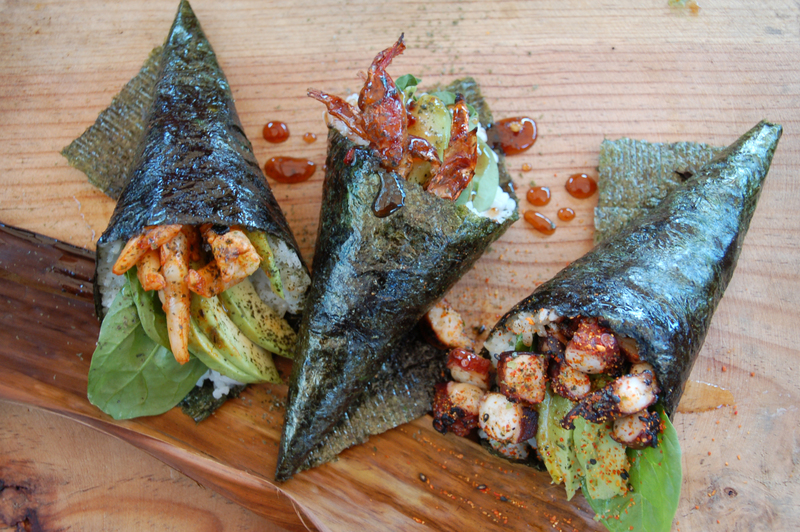 Hand rolls from Tatami, Colectivo 9. Nine chef friends pooled their resources to open Colectivo 9 in 2014. Located on Tijuana’s Avenida Revolución, this cozy grouping of food stalls occupies an open space formerly inhabited by souvenir hawkers. You can find everything here from red snapper ceviche at restaurant La Martina to a pulled-pork covered beef patty from Indie Burger. There’s sushi and grilled octopus, shrimp and excellent soft shell crab hand rolls to be had at Tatami Japanese Grill. 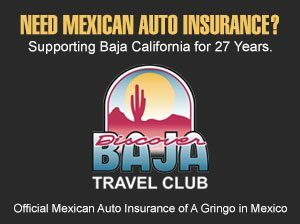 Cold Baja California craft brews are available at Barrica to help wash down all of the good food here. MUST TRY: For desert, stop in at chef Jordana Salas’ Oh! Bon Bon where an eclectic assortment of the flavorful chocolates, macaroons and small cakes temptingly await in climate controlled glass display cases. A favorite here is the jamaica cilantro bon bon. Colectivo 9 is located between 6th and 7th Avenue on Avenida Revolución 1265 in El Centro, Tijuana 22000. +52 664-123-1234. www.colectivo9.com. Open Tue-Thu 1PM-8PM, Fri & Sat 1PM-12AM, Sunday 1PM-8PM, Closed Mondays. Smoked marlin stuffed chili gueros at Otto’s Grill, Telefonica Gastro Park. Named for it’s location near the telephone company on Ocampo Boulevard in Zona Centro, the Telefonica Gastro Park is one of the city’s most popular spots in which to dine, enjoy a craft beer and spend time catching up with amigos. The choices here are myriad. Chef Giovanni Brassera at HUMO smokes his own sausages using a barrel smoker strapped to the side of his trailer. The lingua milanesa torta at Carmelita is droolingly good. Other not-to-be-missed trucks and stalls here are Sobre Ruedes, Creta, Maquina 65, Ta’costeño and chef Javier Plascencia and Adria Marina’s Don Ramen. MUST TRY: Otto’s Grill is THE spot for fresh raw and prepared seafood. Chef Otto Spahn’s smoked marlin stuffed chilies are sublime. 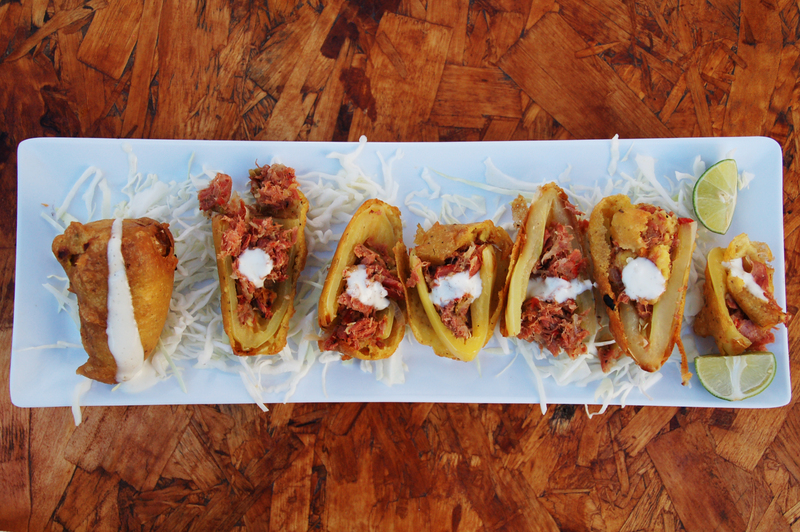 Tender, flavorful smoked marlin is stuffed in a roasted Poblano chili, then deep fried in beer batter, sliced open, drizzled with crème fraîche and served atop a bed of shredded cabbage. Telefonica Gastro Park is located at Avenida Ocampo 2036, with an entrance from Agua Caliente Blvd., Tijuana 22000. +52 664-123-1234. www.facebook.com/pages/Telefonica-Gastro-Park. Open Mon-Sun 12:00PM-8:00PM. Pizza at Via Bravo, Bunker Food Crew, Tijuana. Zona Rio’s Bunker Food Crew is perfectly located to serve the business lunch crowd, and even make deliveries via bicycle to neighborhood office buildings. 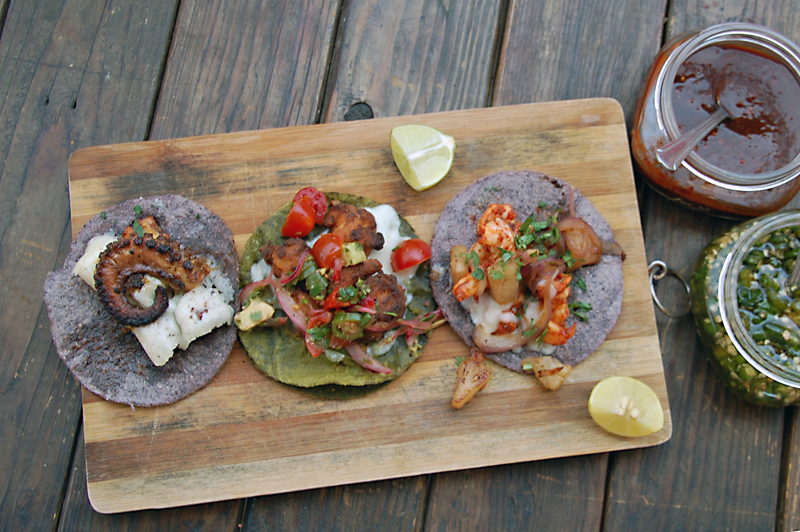 This small colectivo of four trucks opened in 2014 and offers several delicious options. Mi Lupita specializes in “elevated” tortas and tacos, including a riff on owner Marko Diaz Amador’s grandmother’s conchinita pibil, a Yucatanean style pulled pork. Other trucks here are the French focused Rodante for crepes – including smoked marlin – and minibus turned Mexican parrilla, Calafia. 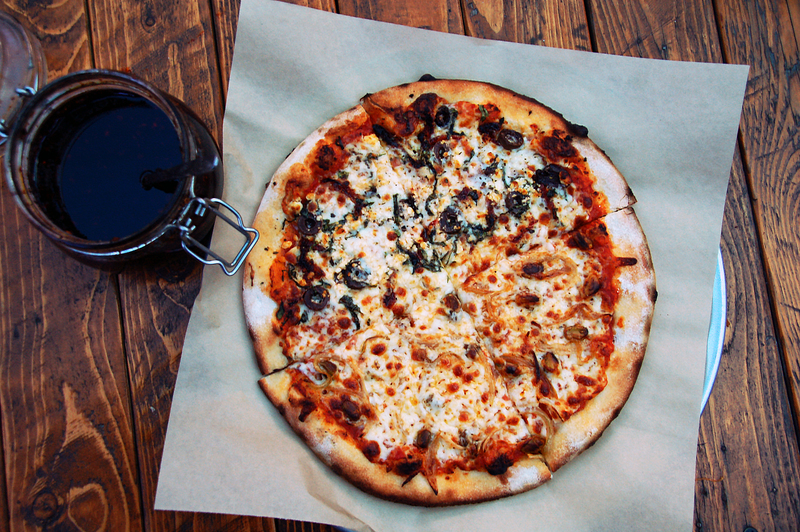 MUST TRY: Chef Daniel Mata’s truck Via Bistro houses a wood fired pizza oven where he creates his artisanal and delicious thin crust pizzas using a stack of fragrant olive wood as a heat and flavor source. The chef suggests a half and half pie so that you can try two of the pizzeria’s specialties that include pistachio, kalamata and Portobello. Bunker Food Crew is located at Calle Diego Rivera 2347, Zona Río, 22240 Tijuana. www.bunkerfoodcrew.com. Open Mon-Thurs 10:00AM-7:00PM, Fri & Sat 12:00PM-10:00PM. Closed Sundays. El Punto opened in Jaunary 2015 with the truck Musmon, specializing in grilled dishes such as rack of lamb, duck, octopus and tuna. Vikingo, Fast Gourmet, Carreta, Ni Pai, and sweets-peddler I Love Brownies – who offer dessert pizzas – soon followed. MUST TRY: If you don’t have a problem with calorie or sugar intake, food truck Porketta is known for their hamburgesa de dona glaseada, or hamburger on a glazed donut. This sinful indulgence comes with American cheese, fried egg and bacon dressing. El Punto Food Trucks is located at Paseo del Río 6642-0, Río Tijuana 3a, Tijuana 22226. +52 664-203-3431. www.facebook.com/elpuntofoodtrucks. Open Mon, Wed, Thu 12:00PM-7:00PM, Friday & Sat 12:00PM-8:00PM, Sun 12:00PM-6:00PM, Closed Tuesdays. 2 Comments on 5 HOT Food Colectivos You Must Try in Tijuana! As always, great article Scott. You’re making me hungry! Yum! I’ve yet to visit Bunker and El Punto.